Ok, so I've sat here for twenty minutes, trying to think of a whitty and amusing introduction to this article, but I can't and so I'll simply just Dive-in! 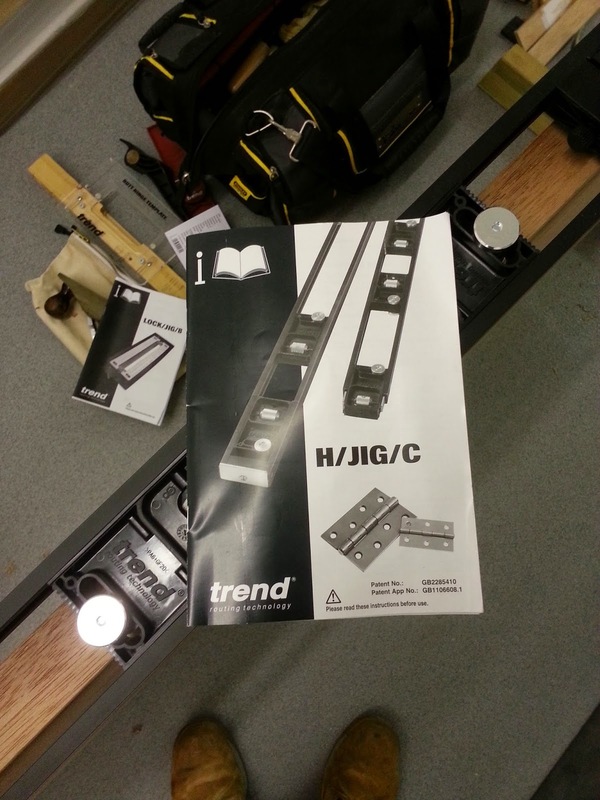 I've been using trend products for as long I've been woodworking, pretty much, I try to buy the best quality bits of kit, that I can afford, and was introduced to Trend by a neighbor who was a carpenter. I've bought a few of their jigs, some cutters, and routers. If you've seen any of my router videos on YouTube, you will no doubt have seen many of their products in use. I'm normally, if perfectly honest, "buy-in" to many internet reviews. With comments and thoughts like "just say it's great so they send you more stuff", or "well of course you're going to say it's great, you're being paid to". We've all had these thoughts, so let me lay the cards on the table from the start: I'm not being paid by trend, nor any other company. If the item is rubbish, or can be improved on I'll say it. Why say it's good to "get more stuff, presumably that will be similar quality. Lastly, and possibly more importantly, I already use trend products, and have done for a long time now. I found the jig very easy to set-up, the instructions are detailed, without being over-complicated, with the important and salient points marked for emphasis. along with the instruction book, all trend products come with a warranty card to fill out and post back. If you have a couple of minutes, you can also fill out the information at the trend website, it's simply a case of setting up and giving the details of the product, along with the serial number if it has one. Being a Two-piece jig, its important to get the parts connected in the same orientation, the 2 red arrows make it quick and easy to see it's correct, without really even needing to think too much about it. Also the knurled locking knob has three equally spaced holes around the circumference which are sized to take a standard 1/4" hex driver fit to allow it to be "cranked up tight". Supporting the door whilst machining is very important, I use a combination of the modern and the old skool methods, The trend door stand, and a cut-down piece of 4X2 and a wedge. The Jig can then be secured to the edge of the door using the 4 awls that come with the kit. I was a bit nervous using these as two of the doors were hardwood and pre-glazed, but with the sharp points, they went in, and came out fine with no problems or broken glass. Setting the hinge apertures is a doddle! The blocks are moulded with a 2mm horn in all corners, so you just fit the hinge in and slide up the blocks, no need to measure anything, as the guide bush offset is all taken care of, the radius of the 16mm guide bush means it doesn't effect the path as you route out the mortises. setting the width of the hing leaves is much the same, you use the hinge and move the round stops upto it. 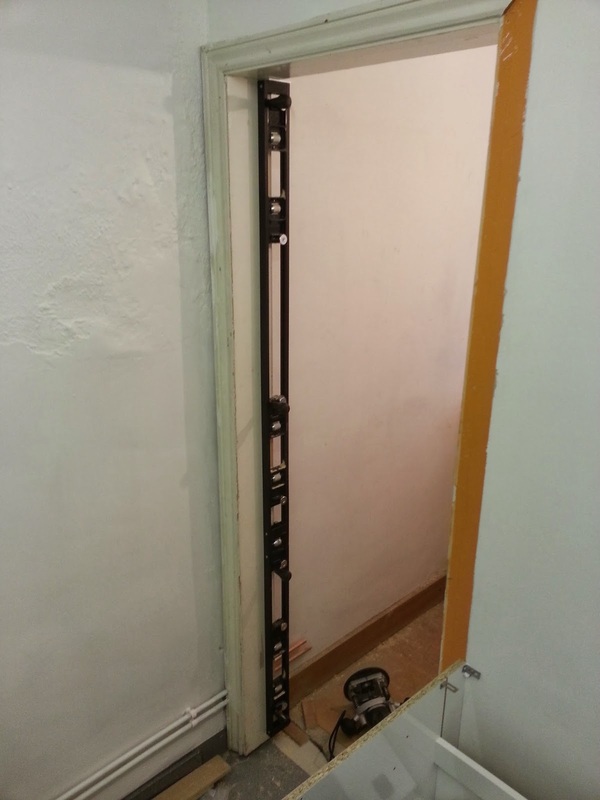 I did the end two first, positioned the jig to the door, then fixed it and moved all the intermediate stops to it. super simple. Everything you need comes in the bag, apart from the cutter. A long reach 12mm is needed as the jig is quite high. It's basically a standard 12mm X 19.1mm cutter head, but on a longer shank, these are available from the stockists, and from the pro/craftsman/trade range of trend cutters. that's silver, green and black - I got the cheap one ;-) I've since seen some stockists offering a free cutter with kit as well. I wouldn't be surprised if trend follow this in the next round of offers. 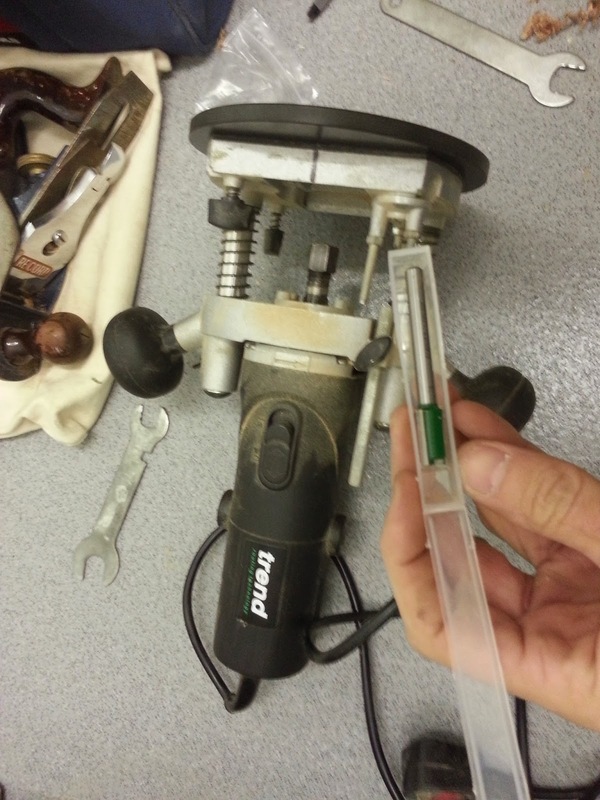 (which are usually well worth keeping an eye on, I bought the DC400 dovetail centre in 2010, and they had an offer of the full cutter and accessory set thrown in!). If like me, you have the T4 router rather than the T5, you need a slightly different setup on the guide bush. This is because the tolerances for the base and the plunge columns is not as tight as on the T5, and other routers. You can either get the T$ specific guide bush, same price as all guide bushes, or use a uni-base, or GB/5 sub base. 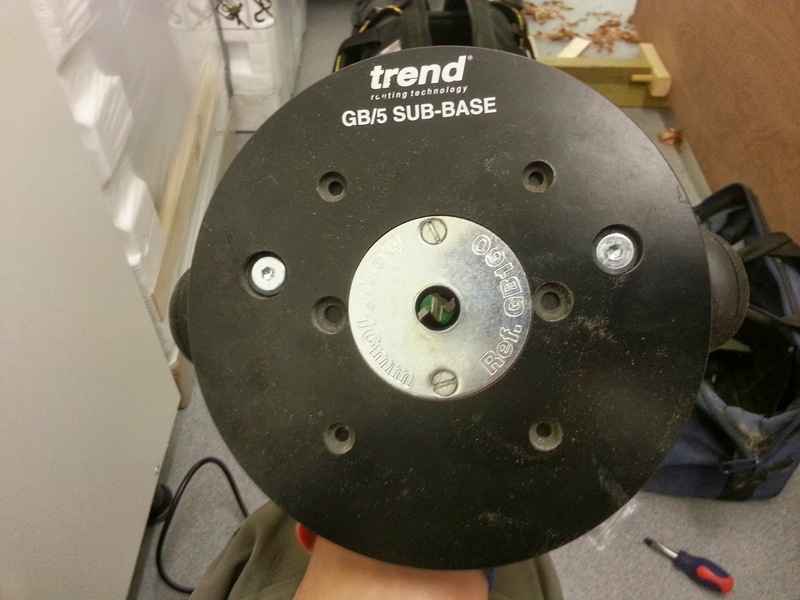 I fortunately already had the GB/5, for an old Ryobi router, had I not, I'm not sure which route I would have taken, probably the guide bush, but the sub bases are worth a look if you have non-trend routers, as you can then use the guide bushes and other accessories. 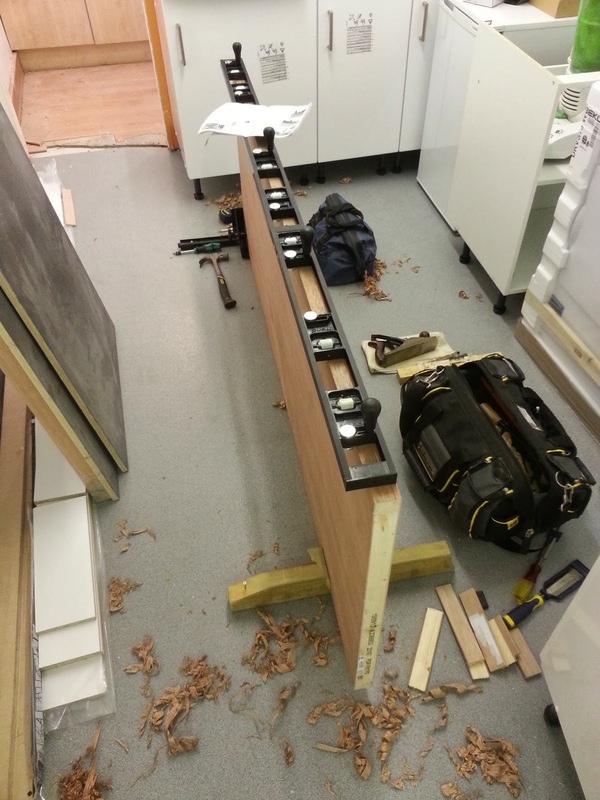 Once the door has been routed, you simply turn the jig over and mount it to the frame. JUST MAKE SURE YOU LINE IT UP ON THE TOP OF THE DOOR!! if not you'll be swearing! 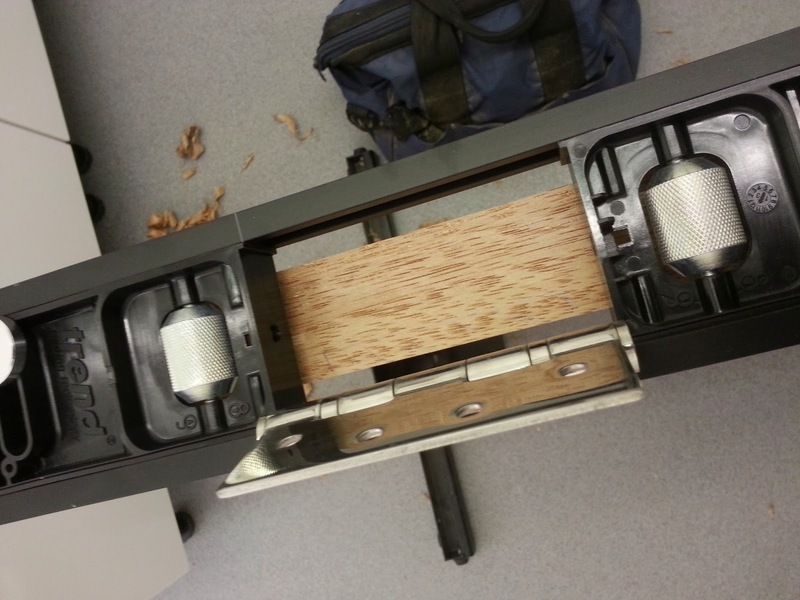 In conclusion, it's a very expensive, but well thought out and versatile jig. if you hang a lot, or are likely to hang a lot of doors, then this will very quickly pay it's way, and speed up the process no end. particularly if you charge per door to hang! I especially like the fact that you can use any existing hinge points on the frame to mark out for the hinge points on the door. It's well made, and sturdy. If you're still wanting a little more, you should check out my YouTube video, it's a little long, but I also talk a bit about the background of the job i did to test the jig, and a couple of alternate products too. 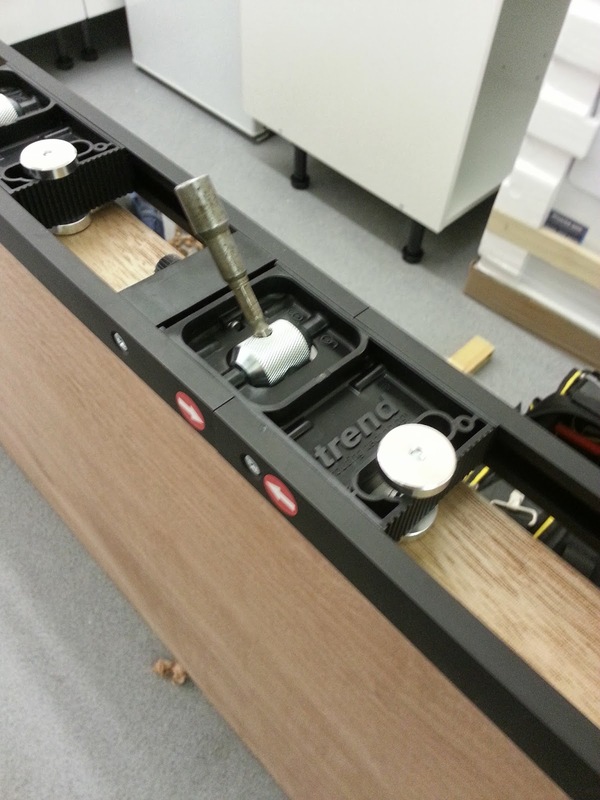 Don't forget to check back soon for a review of the New Trend adjustable trade lock jig, In all better and more versatile than the older metal version.